David A. Engdahl was born on June 15, 1924 in Titusville, PA. He served in the European theatre during WW II with the 580th division. After the war he attended photography school in Chicago, IL. While attending school he met his wife Janet Scheel. They were married on June 28, 1948 in Chicago. Soon after they were married they moved to Rochester, New York where he attended Rochester Institute of Technology. He graduated in 1949. 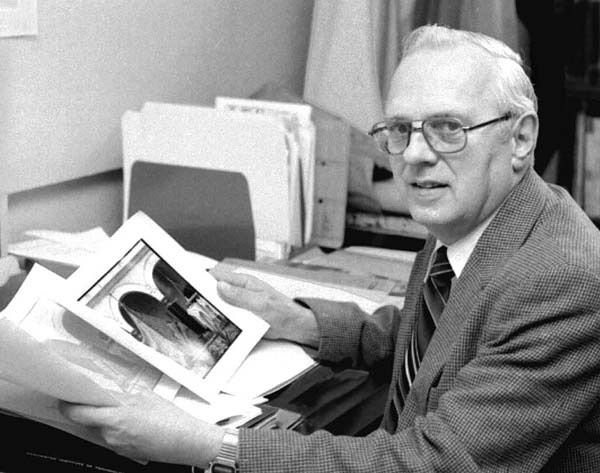 He was an instructor and an administrator at RIT from 1949-89 in the School of Photographic Arts and Sciences. 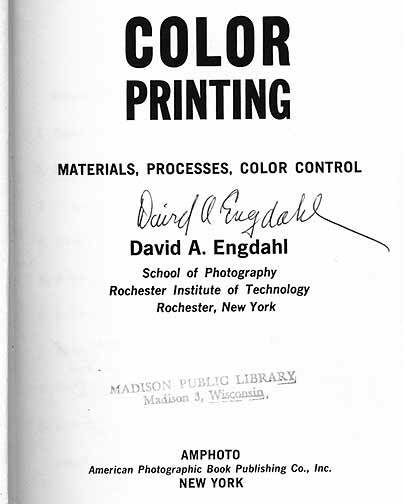 He was one of the school's prèmier color printing instructors during his classroom years and is the author of several articles and a book on color photography, Color Printing - Materials, Processes, Color Control, published in 1967 by Amphoto. His hallmark signature, seen on the book page on left (click on it to see it larger) graced many a document that left the administrative offices of the school during his tenure as an administrator. He retired from RIT in 1986 as associate director of the school and later taught part-time for three years. He was active in the Society of Photographic Scientists and Engineers and also co-authored a book with Hollis Todd. David and Janet joined Lake Avenue Baptist Church in 1950. He served in many roles at the church. 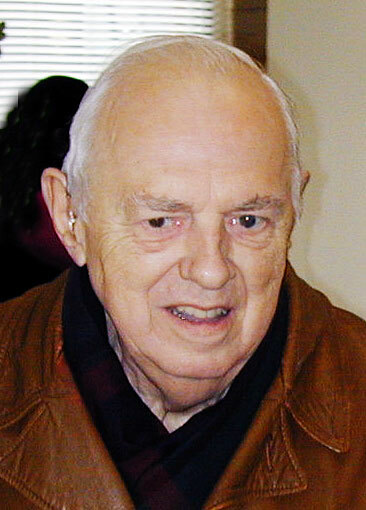 He was a church school teacher, member of the Board of Trustees and served as Treasurer for eleven years. David and Janet had four children: Scott Engdahl, Jon Engdahl, Kristine Hamilton and Dean Engdahl. Their five grandchildren are Adam Engdahl, Jeremy Hamilton, Jason Hamilton, Kaitlyn Engdahl and Kristen Engdahl. David's many hobbies and interests included stamps, stamps, & stamps, photography, history, chair macrame and anything related to his Swedish heritage. He also played Pokeno, Bingo and was an adamant Bridge player for 55 years. Dave Engdahl was a teacher, an administrator and a man of faith that was evident in all of his dealings with students and colleagues. As one of his students in 1953, he taught me color and, by example, patience and commitment. As a new member of the faculty in 1958, I turned to him on a number of occasions for advice. He was very helpful and generous with his time. He also was a pretty good card player and it was a pleasure to watch him as he, Hollis Todd, Al Rickmers and Bill Shoemaker played the game on the old campus in a office shared by all of us. The only problem Dave had was that he did not smoke, whereas Rickmers smoked his cigar during the game, Todd, his pipe and Shoemaker, his cigarette. Everyone at the table was buried in smoke. To add to the deluge of smoke, C.B. Neblette would come in on ocassion, smoking a king size Dutch Master cigar. I first met Dave as a student in my freshman class shortly after WW-II, then knew him as a colleague and a friend during our long teaching careers and too few retirement years before his untimely death. Many years ago he formed a bridge foursome with three other members of his church, and when one of them moved out of town, Dave invited me to join the group--and we have played together almost weekly ever since. When he and Jan moved to a retirement home, Dave's love of teaching moved him to give lessons to other residents who wanted to learn to play bridge and make macrame chairs. His friendly and outgoing personality was demonstrated by the fact that he was soon able to greet all of the other residents and staff members with their first name. Even though Dave was one of the most recent residents in the home, he was elected to be president of the residents' council. Knowing Dave has added much joy to my life. Thank you Dave. 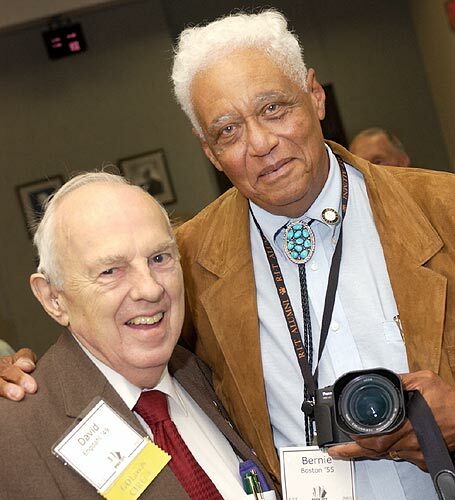 At the Golden Circle Luncheon at Brick City Homecoming on Oct. 7, 2005, Ken Huth, '88, made the above photograph of Dave and Bernie Boston. 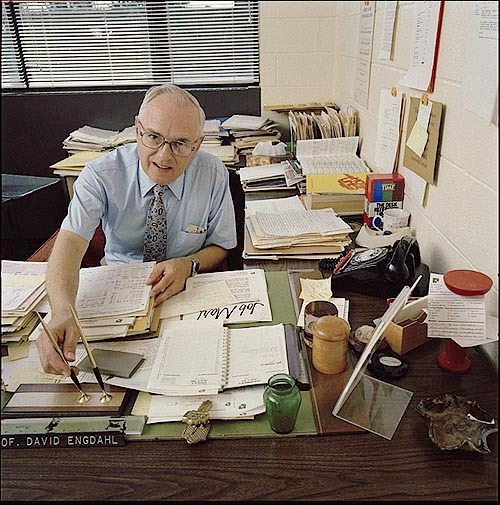 All of us who have been here for a few years will remember Prof. David (Dave) Engdahl. We received word from his family that he died last night. This was a result of complications from leukemia and pneumonia. Dave, in his "always teaching" mode, had made arrangements for his body to be donated to the Strong Memorial Hospital "Anatomical Gifts" program. Dave, thanks for your friendship and all the good times. We'll miss you.